Following last year’s success, Prof. Mona Boaz (Head of the Nutrition Department at Ariel University) invited the whole group of undergraduate Nutrition Students to participate in the campaign. In addition, Dr. Vered Kaufman Shriqui, a senior lecturer at the university joined the initiative and in coordination with the mayor of Ariel’s city, three elementary schools were chosen to receive the KERI presentations. 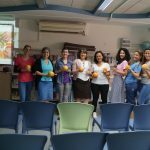 This year the presentations will be made in three elementary schools (three groups each, 3rd year) by 36 undergraduate Nutrition Students from Ariel University. This year the evaluation component will be expanded, not only the KERI tool will be evaluated but also the undergraduate students’ performance. The questionnaire was validated from English to Hebrew and we are seeking to provide promising outcome data.